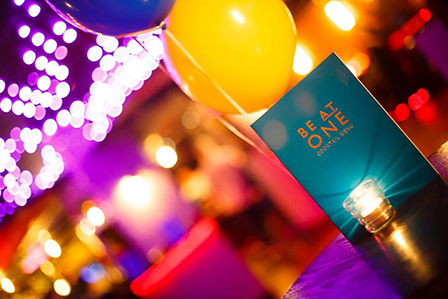 Be At One is a chain of cocktail bars across London which stretches west into Bristol and Bath and north to Milton Keynes. 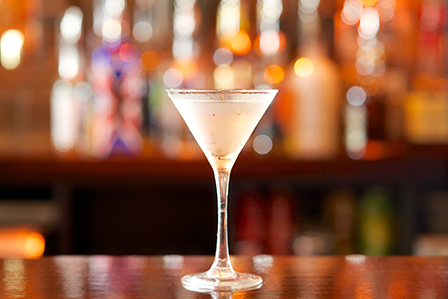 Their ethos is simple; killer tunes, great vibes and tasty drinks. 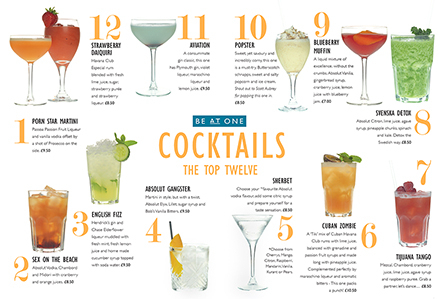 Their menus are known for being extensive and playful and the group is increasingly being spoken of as a great training ground for aspiring bartenders. Be At One may not be the most serious cocktail bar you'll walk into, far from it in fact, and the drinks are definitely on the fun side of bartending. But we've yet to have a bad night in one of these fabulous venues. We're fans to say the least. To celebrate the groups new menu here are six of their delicious drinks. Their more popular serves, apart from the usual classic cocktails, include the Cuban Zombie, the Blueberry Muffin and the Wild Tea and Elderflower Martini. On the more creative side they've chosen to share with us the Popster, using sweet and salty popcorn, the Sherbet with citric syrup, and the Svenska Detox. "The overarching theme was to give our guests what they wanted and to create a well-balanced menu that has something for everyone - we serve a very broad range of people from beginners to well-seasoned drinkers. 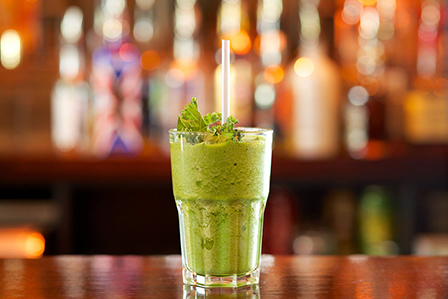 We've added three new ice cream cocktails to our menu which is a category that we have made our own, we've discovered new ingredients such as citric acid and we've also combined the latest 'superfood' ingredients such as spinach and kale to create some really exciting new drinks," said Sarah Swaysland. Method: Combine ingredients in blender with 1/2 a scoop of crushed ice and blend. Pour into glass. Method: Stir ingredients over ice and strain into chilled glass. Method:Combine ingredients in blender with 1/2 a scoop of crushed ice and blend. Pour into glass. Method:Build ingredients in the glass over cubed ice. Method:Add all ingredients to the shaker, stir to loosen jam, shake and double strain into chilled glass. Method:Shake ingredients over ice and fine strain into chilled glass.